(Work...) I been workin' too hard..
We Gotta Get out of This Place", occasionally written "We've Gotta Get out of This Place", is a rock song written by Barry Mann and Cynthia Weil and recorded as a 1965 hit single by The Animals. It has become an iconic song of its type and was immensely popular among United States Armed Forces during the Vietnam War. "We Gotta Get out of This Place" was written and recorded as a demo by Mann and Weil, with Mann singing and playing piano. It was intended for The Righteous Brothers, for whom they had written the number one hit "You've Lost That Lovin' Feelin'". But then Mann gained a recording contract for himself, and his label Redbird Records wanted him to release it instead. Meanwhile, record executive Allen Klein had heard it and given the demo to Mickie Most, producer for The Animals. 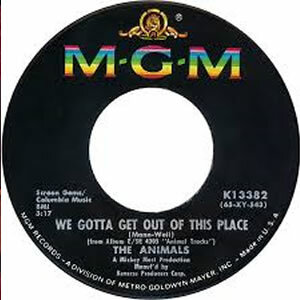 Most already had a call out to Brill Building songwriters for material for the group's next recording session (the Animals hits "It's My Life" and "Don't Bring Me Down" came from the same call), and The Animals recorded it before Mann could. The arrangement featured a distinctive bass lead. Ubiquitous British session drummer Bobby Graham later stated that he played on the record, not Animals drummer John Steel. It featured one of singer Eric Burdon's typically raw, fierce vocals. Rolling Stone described the overall effect as a "harsh white-blues treatment from the Animals. As [Burdon] put it, 'Whatever suited our attitude, we just bent to our own shape.'"